In my first full years birding at the ‘patch’ I have done reasonably well I think. I have recorded 171 species in total including a number of rare or unusual birds such as Egyptian Nightjar, Black Stork, Short-toed Snake Eagle, Eastern Imperial Eagle, Spur-winged Plover, Crested Honey Buzzard, Great Snipe, Pin-tailed Snipe, Long-toed Stint and Common Rosefinch. Birding has been excellent on the whole, with spring migration starting early and the first migrants seen in January and numbers increasing through February with a peak in March and April when most species where recorded as well as the most number of birds. Autumn migration was much slower and more prolonged but again with some good birds seen. The draining and removal of all the reed beds in the percolation pond at the end of November hampered birding for a month or two and almost certainly reduced the number of species seen in December and January but there was still plenty to see elsewhere such as the spray fields and jabals. 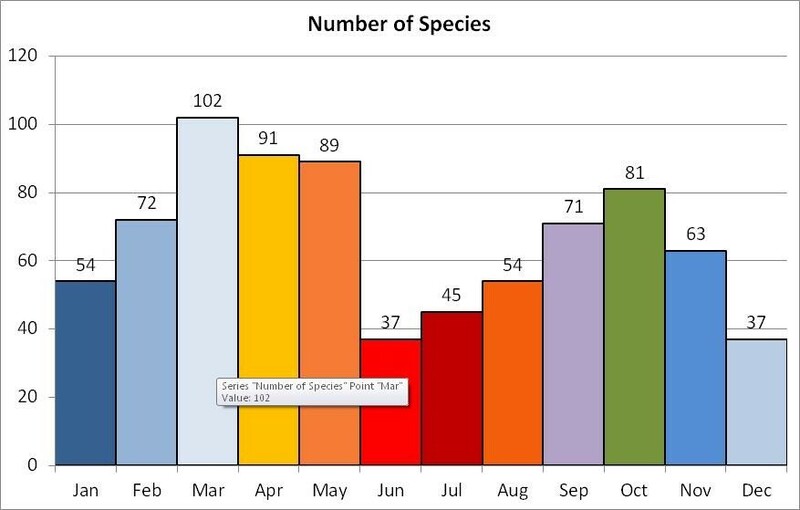 The below graph shows the number of different species seen on the ‘patch’ per calendar month to give an indication on which months are the best for birding out here. Part of the reason for the low numbers in winter are the days are short and evening birding is limited after work so time spent in the field is much lower than in the spring and summer months. Numbers in the summer months of June and July may be slightly higher than expected as I was able to go birding more often due to the longer days and the fact the family were on summer vacation. Also don’t forget this is a desert area with little natural habitat that would attract birds, and I know some of you will see the number of birds I have seen here in a year in a day, but the point is that Dhahran is a Bird-watching hotspot for the region and an enjoyable place to spend an hour or so each evening. An excellent tally - the quality of the birds are superb. How long is your stay there to be? All going well I can stay here until I am 60 years old so that is another 11 years. Will have to see how it goes as to how long I will sgay but I plan on staying for a good while.